ASTRONAUT JOHN GLENN WAVES DURING TICKER TAPE PARADE IN NEW YORK. 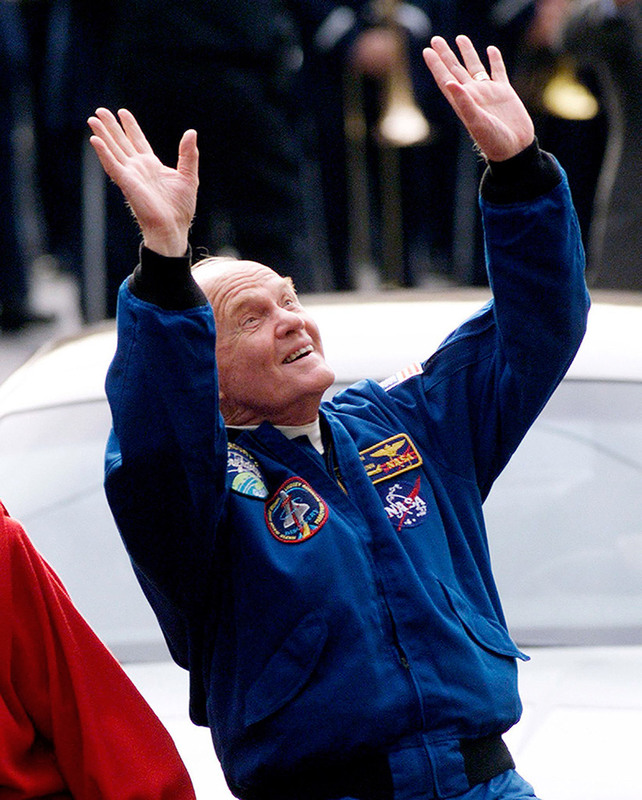 Astronaut John Glenn waves to people looking down from buildings as he and his wife, Annie, ride in an open car during a ticker tape parade down New York's "Canyon of Heroes." Crowds of cheering people lined Broadway to cheer Glenn and the rest of the crew of the Space Shuttle Discovery, 36 years after New York staged it's first parade for the heroic astronaut. Glenn recently became the oldest man to fly on the space shuttle at the age of 77. Driving the car was a police officer whose father drove Glenn during his first ticker tape parade in 1962. Astronaut John Glenn waves to people looking down from buildings as he and his wife Annie ride in an open car during a ticker tape parade down New York’s “Canyon of Heroes” on lower Broadway, November 16. Crowds of cheering people lined Broadway to cheer Glenn and the rest of the crew of the Space Shuttle Discovery, 36 years after New York staged it’s first parade for the heroic astronaut. Glenn recently became the oldest man to fly on the space shuttle at the age of 77. Driving the car was a police officer whose father drove Glenn during his first ticker tape parade in 1962.